Non medicated, polyester mesh dressing for atraumatic wound care. Mepitel is a porous, semi-transparent, low-adherent wound contact layer, consisting of a flexible polyamide net coated with soft silicone. The silicone coating is slightly tacky, which facilitates the application and retention of the dressing to the peri-wound area. This gentle adhesion also tends to prevent maceration by inhibiting the lateral movement of exudate from the wound on to the surrounding skin. The nature of the bond that forms between Mepitel and the skin surface is such that the dressing can be removed with minimum pain and without damaging delicate new tissue. 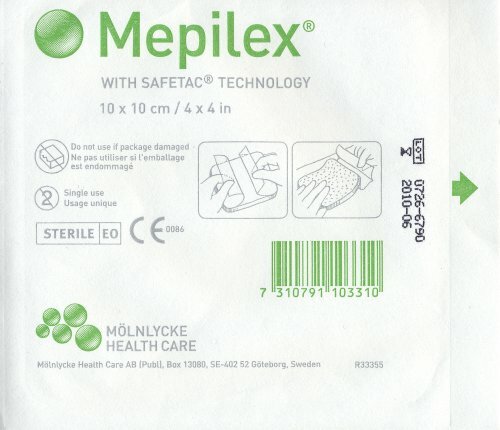 Mepitel is not absorbent, but contains apertures or pores approximately 1mm in diameter that allow the passage of exudate into a secondary absorbent dressing. Mepitel is used in the management of wounds where adherence of a dressing to the underlying tissue represents a particular clinical problem. Typical applications include skin tears or abrasions, surgical excisions, second-degree burns, blistering conditions such as epidermolysis bullosa, lacerations, partial and full thickness grafts, and skin damage following radiotherapy or steroid therapy. The manufacturers have identified no absolute contra-indications to the use of Mepitel. The dressing is supplied between two layers of plastic film, which must be removed before use. Prior to application, if clinically indicated, the wound should be cleansed and the surrounding skin thoroughly dried. A dressing should be selected that overlaps the wound margin by at least two centimetres and, if necessary, this may be cut to size or shape before removal of the protective films. If more than one piece of Mepitel is required, the dressings may be partially overlapped, ensuring that the pores are not blocked. Moistening gloves with sterile water or saline will help to stop the dressing sticking to the fingers and thus facilitate application. Once in position the dressing should be smoothed into place, ensuring a good seal with the surrounding skin, and covered with an appropriate absorbent secondary dressing and a suitable fixation device or bandage. In contoured or jointed areas (e.g. under arm, under breast, inner elbow, groin, deep wounds), it is important to ensure that sufficient padding is applied to keep the Mepitel in intimate contact with the wound surface. Where clinically indicated, topical steroids or antimicrobial agents can be applied either over or under Mepitel. Depending on the nature and condition of the wound, Mepitel may be left in place for extended periods, up to 7-10 days in some instances, but the outer absorbent layer should be changed as frequently as required. When Mepitel is used for the fixation of skin grafts and protection of blisters, it is recommended that the dressing should not be changed before the fifth day post-application. As with all types of dressings, wounds should be regularly monitored for signs of infection or deterioration. When used on bleeding wounds, or wounds producing high viscosity exudate, Mepitel should be covered with a moist absorbent dressing pad. If Mepitel is used on burns treated with meshed grafts, or applied after facial resurfacing, imprints can occur if excess pressure is placed upon the dressing. Following facial resurfacing it is recommended that the dressing be lifted and repositioned at least every second day. Mepilex is an absorbent, atraumatic dressing made from polyurethane foam. The outer surface of the foam is bonded to a vapour-permeable polyurethane membrane, which acts as a barrier to liquid and microorganisms. The membrane, which has a wrinkled appearance, is applied in this way to accommodate the slight swelling that occurs as the dressing absorbs exudate. The wound contact surface of Mepilex is coated with a layer of soft silicone that does not stick to the surface of a wound or cause trauma to delicate new tissue upon removal. This soft silicone layer is also slightly tacky, which facilitates application and retention of the dressing to intact skin, but does not cause epidermal stripping or pain on removal. This gentle adhesion also tends to prevent maceration by inhibiting the lateral movement of exudate from the wound on to the surrounding skin. Mepilex is suitable for dressing many types of exuding wounds including leg and pressure ulcers, and traumatic wounds resulting in skin loss. It may also be used under compression bandaging. The dressing absorbs exudate and maintains a moist wound-healing environment whilst minimising the risk of maceration. The wound contact surface of the dressing is protected by a divided plastic film that must be removed before use. If clinically indicated, the wound should be cleaned and the surrounding skin thoroughly dried. A dressing should be selected that overlaps the wound margin by at least two centimetres. If required Mepilex may be cut to size or shape before removal of the protective film. Once in position the dressing may be held in place with a bandage or other suitable retention aid. Additional absorbent pads are not usually required, as the plastic membrane on the outer surface of the dressing will prevent the passage of exudate from the Mepilex to the secondary absorbent layer. The interval between changes will normally be determined by the degree of exudate produced but the dressing may be left undisturbed for several days on clean lightly exuding wounds. The presence of clinical infection does not preclude the use of Mepilex provided that appropriate antimicrobial therapy is also provided. Sloughy wounds dressed with Mepilex may initially appear to increase in size due to autolytic debridement promoted by the moist conditions produced beneath the dressing. This is normal and to be expected. Mepilex should be stored in dry conditions below 35C (95F). Melolin consists of a film of poly(ethylene terephthalate), onto which is bonded an absorbent layer consisting of a mixture of cotton and polyacrylonitrile fibres, backed with a layer of an apertured non-woven cellulose fabric. The plastic film is present to prevent the dressing adhering to the surface of the wound, and is perforated to allow the passage of exudate from the wound into the body of the pad. Melolin may be used on its own to dress dry sutured wounds, superficial cuts and abrasions, and other lightly exuding lesions. It may also be used as the primary wound contact layer for more heavily exuding wounds, if backed by a second absorbent dressing. In common with other perforated plastic film dressings, Melolin should be used with caution in the treatment of leg ulcers that produce copious quantities of very viscous exudate. Under these circumstances, the exudate may become trapped under the dressing, leading to maceration and inflammation of the surrounding skin. Melolin has a relatively low absorbent capacity and is therefore intended for use on lightly exuding wounds. In these situations, a single dressing may simply be secured in position with surgical tape. On more heavily exuding wounds, Melolin may be used as a wound contact layer, beneath a secondary absorbent pad held in position with tape or a bandage. The frequency with which the dressing should be changed depends entirely upon the nature and condition of the wound. Acticoat consists of two layers of a silver-coated, high-density polyethylene mesh, enclosing a single layer of an apertured non-woven fabric of rayon and polyester. The three components are ultrasonically welded together to maintain the integrity of the dressing in use. Silver is applied to the polyethylene mesh by a vapour deposition process, which results in the formation of microscopic `nanocrystals’ of metallic silver. In this nanocrystalline form, metallic silver exhibits pronounced antibacterial activity against a wide range of Gram-positive and Gram-negative bacteria including strains resistant to many types of antibiotics. It is also effective against clinically important strains of yeasts and fungi. 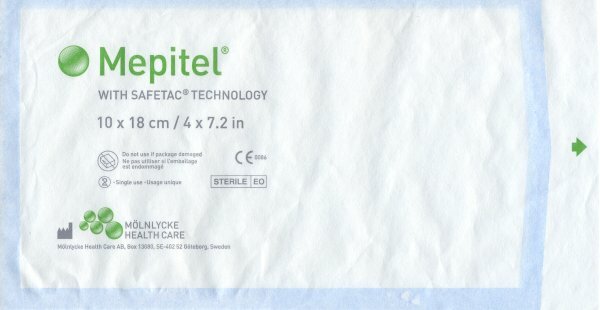 Acticoat is used as an antimicrobial barrier layer for partial and full-thickness wounds such as burns, donor sites and graft recipient sites that are judged to be at risk from infection. 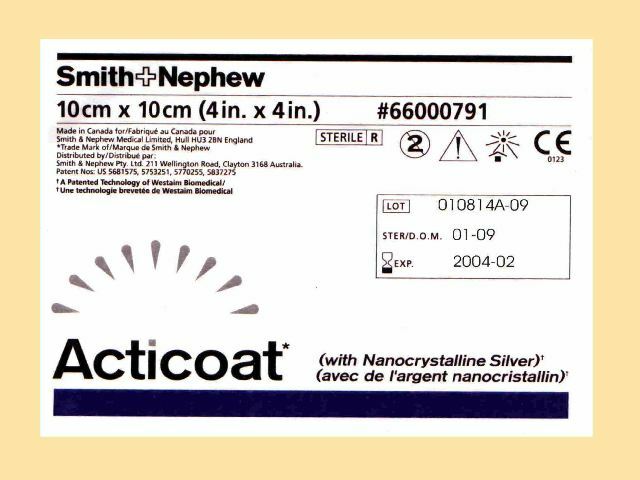 Acticoat is contra-indicated in patients with known hypersensitivity to any of the components of the product. If signs of a sensitivity reaction develop during use, treatment should be discontinued. No safety issues associated with the use of Acticoat have been identified to date. It is recommended that prior to use Acticoat be moistened with sterile water, not saline. This will help to ensure that the dressing provides a moist wound-healing environment whilst enabling the silver to exert its antimicrobial effect. If necessary, the dressing may be trimmed to the appropriate size and shape of the wound prior to application taking care that the darker blue surface is placed in direct contact with the skin. Acticoat should be covered with a secondary dressing the choice of which is determined by the degree of exudate produced by the wound and held in place with surgical tape or a bandage as appropriate. It is recommended that the dressing be left in place for a maximum of three days, although on very heavily exuding wounds, it may be necessary to replace it more frequently. Acticoat should not be used with oil-based products or other topical antimicrobials. If applied to very lightly exuding wounds there is a possibility that the dressing may dry out and adhere to the wound surface. This is more likely to happen if the secondary dressing is very absorbent or highly permeable to water vapour. If adherence becomes a problem the dressing should be soaked off to avoid causing pain or trauma to the underlying tissue.